Heart and Sole: in PA the Standing Stone Trail wins. The AT loses. in PA the Standing Stone Trail wins. The AT loses. Looking west from a power line clearing toward Sideling Hill and be - Yond. It's where I want to be. The Standing Stone Trail used to be called the Link Trail. 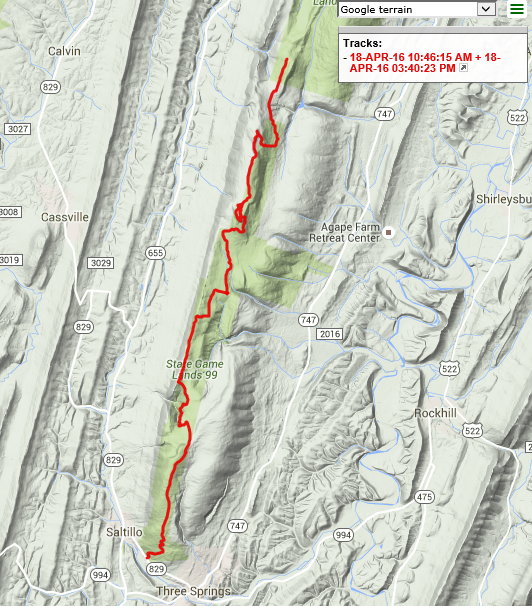 That name suggests its original purpose--a link between Pennsylvania's state-spanning Mid-State Trail and the Tuscarora Trail, which in turn connects to Pennsylvania's portion of the Appalachian Trail. So the Link Trail turned Pennsylvania's extensive trail system into one connected web of footpath. But the Standing Stone Trail is much more than a connector. It is a wonderful experience all its own. As I began to explore it I found not only lots of brutal rocky footing, but places where the rocks have been tamed with well-built flat stone 'pavers' and extensive systems of steps. Best of all, there are loads of excellent viewpoints. Pennsylvania's portion of the Appalachian Trail is dirty and dreary and tedious and boring by comparison. There is very little built trail through the relentless rocks, it's hard to find water, it's too close to the urban blight (think graffiti and litter), and there are only a few good viewpoints. 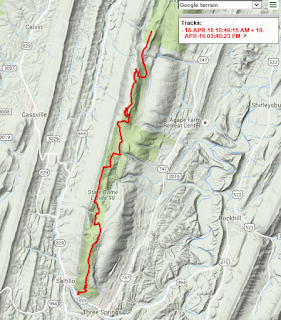 If you're going to experience Pennsylvania's portion of the Appalachian Mountain chain on foot, I would strongly recommend skipping the AT entirely. Instead, try hiking the route I'm now doing. Approaching Pennsylvania from the south, I would get off the AT at Harpers Ferry and head west on the C&O Canal Tow Path. You'll see the best of that trail, including the to-die-for new section through Big Slackwater. 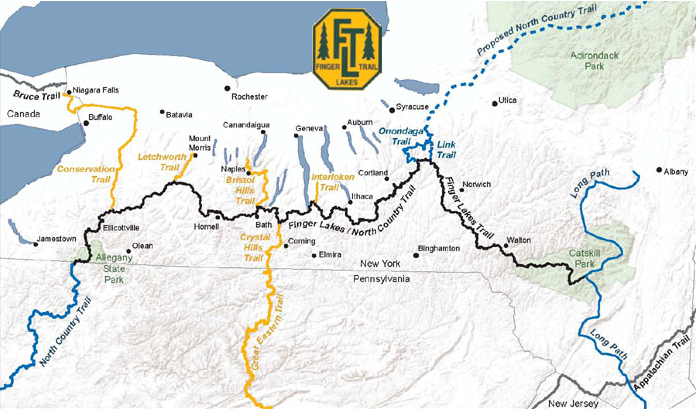 Then hook up with the Great Eastern Trail and follow that north to New York to where it ends at the Finger Lakes Trail. 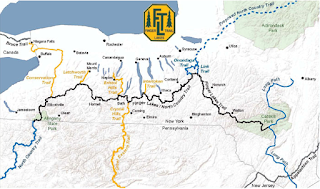 If you're a NoBo thru-hiker and want to continue into the magical White Mountains of New Hampshire and on to Katahdin you can then take the Finger Lakes Trail eastward to its end in the Catskills and connect to the AT in New York via the Long Path. 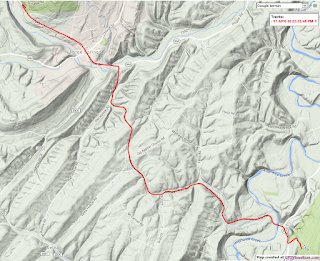 It's a longer route, but it avoids the part of the AT that most people hate and it will expose you to the best of Pennsylvania's wild trails. Okay, getting off my soap box and back to reporting my hike experience, I started up the Standing Stone Trail on Day 4. Here's the track. The first thing that I came across was "Vanderbilt's Folly". It's a railroad boondoggle - never finished because of political and financial wrangling among the wealthy tycoons and financers of the late nineteenth century. Here's an optimistic glimpse of the construction - light at the end of a culvert tunnel under the railroad grade. This was light that the poor people who invested in and worked on the project never saw. It was here that W. H. Vanderbilt uttered his famous "The Public be damned". Moving on up to the mountain ridge there were plenty of viewpoints. The views west toward the wilder parts of the state were the best (see the headline photo up top). This is lightly populated country. Even on the seven mile road walk I did on Day 5, I encountered only a handful of vehicles. Most of this day's walk featured quiet pastoral views. Here I walked truly rugged trail - jagged rocks and uncompromising boulders. But there were killer views to make it all worthwhile. The rock outcrops had great names. Here's the 'Throne Room' - a seat with 180 degree view. And here's the nearby 'Hall of the Mountain King'. When he gets up off his throne he can walk this ridge and survey his dominion for miles on both sides. 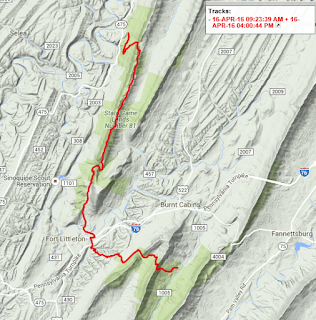 There's a section of new trail - a reroute for a couple miles north of Hooper's Gap where the trail is all constructed, not just a marked route through the untamed rocks. I expect that with time the volunteer crews will be doing more of this. Good on them! It's needed, because other parts of the trail rely on seasonally gated game-land roads. Pretty views and no traffic, but the gravel road bed is not great for hikers. There were more great views from Butler Knob. At 2320 feet, it's the high point of the Standing Stone Trail, but just by a few feet compared with many other places. And finally, also near Butler Knob, was this fine new shelter, built of local cedar logs - clean, inviting, in perfect condition. And the best of Standing Stone Trail was yet to come. Next up - the 'Thousand Steps.' And later, 'Hawk Watch'. Keep tuned. 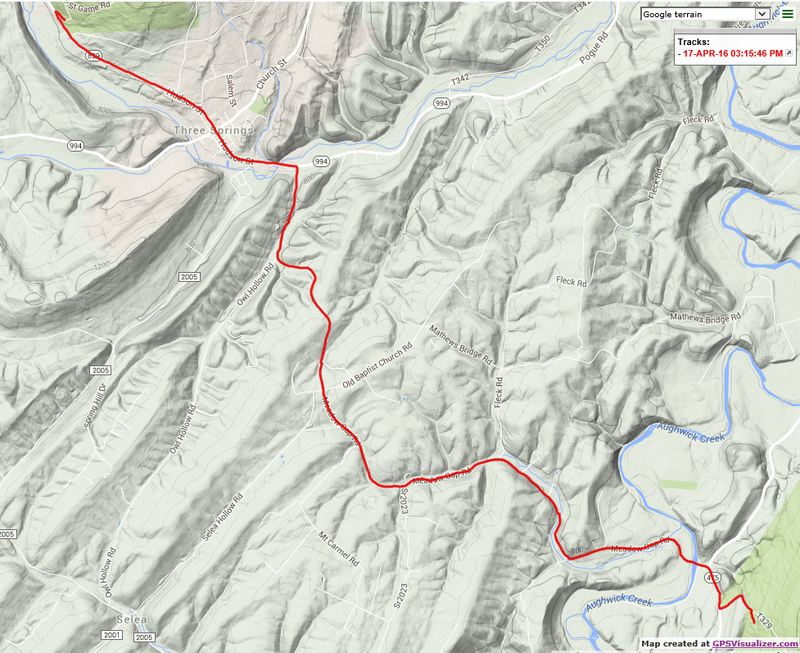 Here are the three days of interactive EveryTrail tracks with embedded, labeled photos. Enjoy.